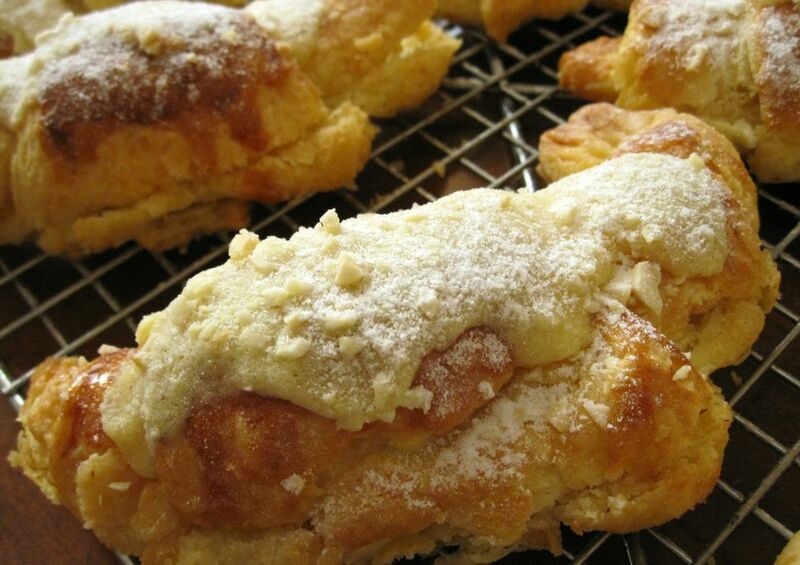 One of our favorite treats served with coffee or tea in Morocco is Almond Croissants. Depending on the bakery, these might be sold as croissants aux amandes, croissants aux creme d'amandes or even simply croissants fourrés. Whatever the exact name, they are delicious – plain croissants are stuffed with a rich almond cream filling known as crème d'amandes. This filling might be used as-is, or mixed with pastry cream for a lighter, creamier texture. The croissants are dipped in a light syrup, topped with some of the fillings, and then baked. A Moroccan bakery might have its own signature variation of preparing Croissants aux Amandes. Some follow French tradition and press the filled croissant quite flat before baking; some add a little orange flower water to the syrup glaze or filling; some top the croissants only with syrup and chopped almonds; others decorate the croissants in the traditional manner with some filling, sliced almonds, and powdered sugar. Start with day-old or fresh plain croissants. You can either purchase or make the basic croissants yourself, but keep in mind that the richer and higher quality the plain croissants, the better the Almond Croissants will be. Slice your plain croissants horizontally with a serrated knife. Don't cut them completely in half – you want the top of the croissant to still be attached to the bottom. With a spoon, spread some almond cream (crème d'amandes) inside the sliced croissant. Use the Creme d'Amande Recipe below as-is, or lighten it by mixing in some ​pastry cream. We use one part pastry cream to two parts almond cream, but you can adjust this ratio to your own preference. Directions: In a food processor, finely grind the almonds with the sugar and salt until the mixture is powdery. Mix in the butter, and add the eggs one at a time, processing until the mixture is smooth and creamy. Stir in the vanilla and almond flavorings. Traditionally the day-old croissants are dipped in a light syrup prior to filling, but since we start with fresh croissants, we prefer to brush on the syrup glaze after we've filled the croissants. This softens the crust a bit and adds sticky sweetness – yum! Directions: Combine the sugar and the water in a small saucepan. Stir constantly over low heat until the sugar is completely dissolved. Increase the heat, bring the mixture to a simmer, and cook for several minutes without stirring. Remove from the heat, and cool. Preheat an oven to 350 F (180 C), and bake the croissants until the filling is set and the edges of the croissant are browned, about 10 to 15 minutes. Remove the croissants from the oven and dust with powdered sugar. Allow to cool a bit before serving. Cooled or leftover croissants can be frozen and reheated directly from the freezer in a 375 F (190 C) oven for 5 to 10 minutes.